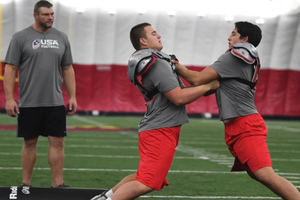 The High School Blocking and Defeating Blocks, Shoulder Tackling & Equipment Fitting course encompasses student-athlete health protocols and skill development. Teaching the proper fundamentals of blocking and shoulder tackling is essential to making football better and safer. USA Football’s Shoulder Tackling, Blocking and Defeating Blocks progressions featuring football experts Scott Peters and Rocky Seto, deliver consistent terminology and a series of drills to teach middle and high school players to play with their head and eyes up and reduce helmet contact. Shoulder tackling drills cover Fundamentals, Leverage, Form Tackling, Thigh and Drive and Thigh and Roll techniques. Blocking and defeating blocks drills include instruction on the bridge and pillar techniques. In addition, learn how to properly fit helmets and shoulder pads. Improperly fitted equipment can increase the chance for injury. The Blocking and Defeating Blocks, Shoulder Tackling & Equipment Fitting course is 1 of 4 courses required earn your Heads Up Football Middle & High School Coach certification. Please make sure the following courses are completed: 1) Heat Illness Prevention 2) Concussion in Sports 3) Sudden Cardiac Arrest and 4) Blocking, Deafeating Blocks, Shoulder Tackling and Equipment Fitting. This Heads Up Football Middle and High School Certification fulfills the online requirements for coaches whose program is enrolled in Heads Up Football. To learn more about the Heads Up Football Middle and High School Coach certification, visit http://www.nfhslearn.com/HeadsUpFootball. To learn more about how your school can enroll in Heads Up Football, visit www.usafootball.com/headsup.